Only two challenges to go. We have some bad hombres here but you’re going to get the keys out. The binary requests a password on running. 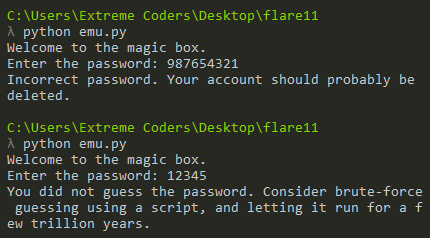 Providing an incorrect password displays a humorous message. Let’s have a quick look in IDA. IDA identifies only a handful of functions. The purpose of the function name exec_instruction and exec_vm will be explained a bit later. The call flow graph is simple as well. 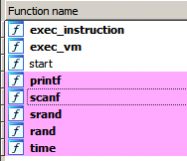 The entry function start calls exec_vm which in turns calls exec_instruction. Apart from this, we can observe calls to time, rand, srand , printf and scanf. start seeds the random number generator with the current time. arr is an array of DWORDs. A random number modulo 8 is then stored at arr. Lastly, it calls exec_vm passing the array as a parameter. The second argument is the size of the array. Let’s have a look at the decompiled code of exec_vm . 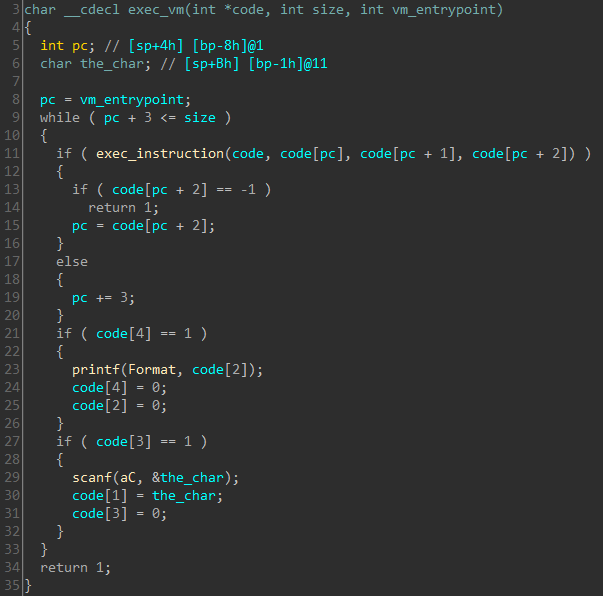 The code fetches three consecutive elements from the array and passes it to the exec_instruction function. The return value decides the next three elements be passed at the next call. All of this is wrapped in a while loop. The experienced eye will immediately recognize this as the dispatch stub used in virtualization based code protection. Let’s have a look at exec_instruction. 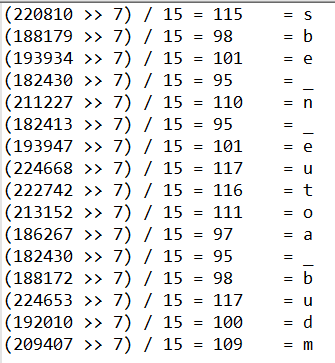 The function subtracts array[i] from array[j] storing the difference back in array[j] . If the third parameter passed is non zero, it returns the comparison of difference <= 0. 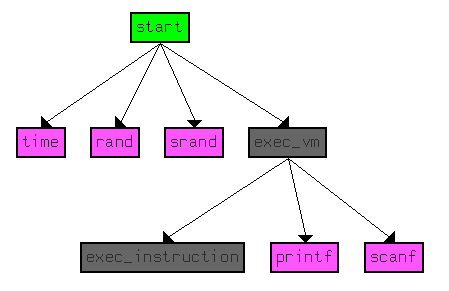 The virtual machine instruction set comprises of only a single instruction and referred to as One Instruction Set Computer (OSIC). The algorithm implemented is Subleq. The logic is simple enough to be implemented in Python. 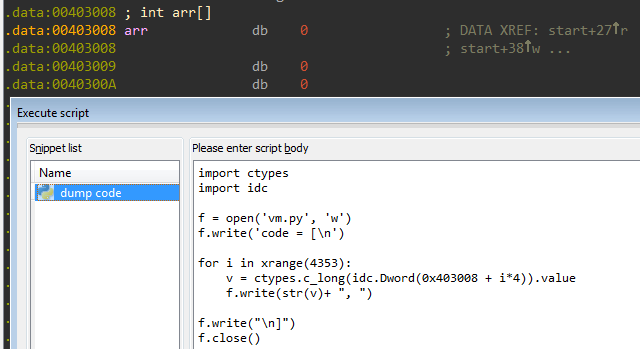 The bytecode for the VM is located at 403008 and can be extracted using IDA Python. Let’s’ test out our shiny new emulator. That’s perfect. At this point, we have a working emulator that mimics the exact operation of the VM. We no longer need the original binary for testing. However, we still have no idea about how the password is checked. 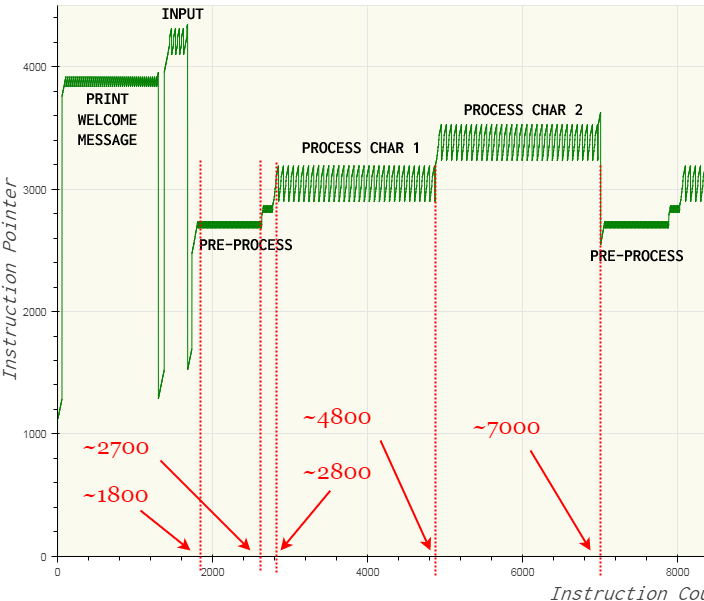 Let us try to get a high-level overview of the password checking algorithm by plotting the value of the instruction pointer during the execution of the VM. To obtain deterministic execution pattern, the random number was replaced with a fixed number 0. Plotting the value of the Instruction Pointer we get the following image when trying with the password “12”. Similarly, trying with the password “1212” yields the following plot. By comparing the two plots, we can observe the number of executed instructions increases with the length of the password. The sawtooth patterns indicate loop. We can also notice that characters of the password are checked two at a time. The value of the instruction pointer never goes below 1000, indicating that offsets 0-1000 stores data. The first and last sawtooth patterns indicate the printing of the welcome and failure message respectively. Correspondingly, this means the function which prints a string is located near offset 4000 in the bytecode. The function which handles input is located near 4200. The four peaks in the input pattern correspond to the four-letter password we provided. Characters at odd position in the password are processed near 3000 whereas those at even-numbered position are processed near 3500. A subleq instruction is a tuple of three values (a,b,c) which performs arr[b] -= arr[a] . We can say the value at a is accessed for reading whereas the value at b is accessed for writing. We can plot the address the program reads from as the execution proceeds. The graph below is for the password “1212”. The plot is quite similar to the execution pattern which implies the data and the code that uses it are located close to each other. Memory address 0 has the highest read count suggesting that its used as a temporary variable for storing the results of intermediate calculations. We can reason that the checking algorithm works by performing some calculations on the password characters and comparing the result to a hardcoded value. By intuition, this check seems to be done at the two points marked, close to 3700. We can trace the executed subleq instructions by modifying the exec_vm function. The number of lines in the trace for password “1212” is close to 15k. Let us inspect the trace using the execution flow graph as a reference. The first preprocess stage occurs when the instruction count is in the range 1800 – 2700. In the trace file, we can see that the ASCII value of the first character of the password is multiplied by 15. The multiplication is done by repeated addition. 735 is then left shifted 7 times to obtain 94080. 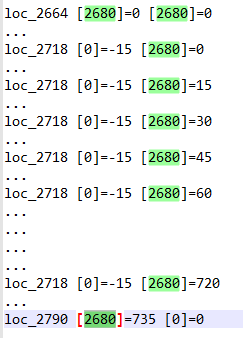 This calculation when the instruction count is in the range 2700-2800. From the memory read plot, we have identified 3700 as the possible location where the result of the previous calculation might be stored. 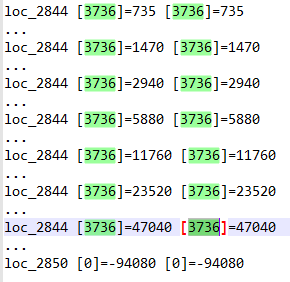 If we inspect the bytecode near offset 3700, we indeed get a list of values. Thus, we have the characters at the odd-numbered positions. This is a subleq challenge, hence the first word seems to be subleq. Lets, try to guess the remaining words using this list of English words. We will be using regex search. 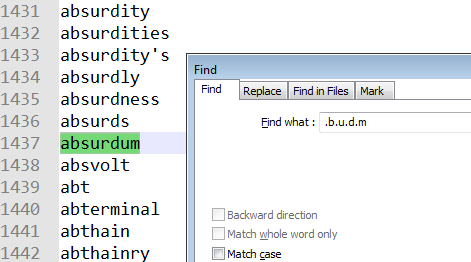 Searching for .b.u.d.m we get exactly 1 hit – absurdum. 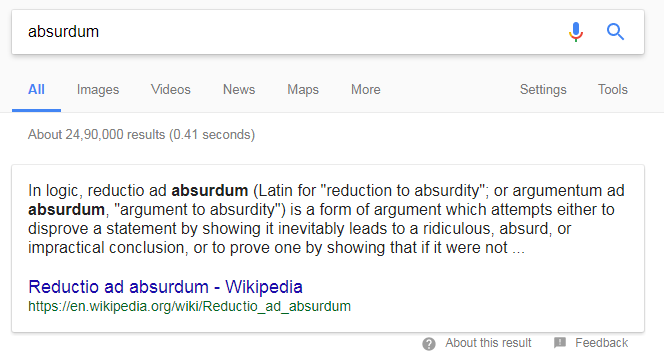 Searching for absurdum on google reveals the word reductio ad absurdum. If we try this as the password we get the much-coveted success message.